Today’s show features a listener who is torn between two wedding venues – one is FREE, one is not. Listen now! 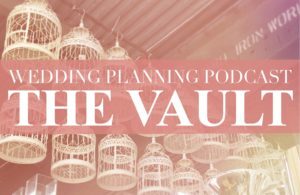 This episode of the Wedding Planning Podcast has been archived, and is currently only available to members of The VAULT. Learn more & sign up for THE VAULT here. As you shop around for wedding venues, it may be tempting to choose a less expensive, “DIY-heavy” option over a full-service space. Sure, saving a couple thousand dollars sounds enticing … but you also need to have a very thoughtful debate about the pros and cons of each space. Specifically, you need to examine and analyze what is and what is NOT included, because what is NOT included – tables, chairs, decor, venue staff, parking, bathrooms – can add up to a lot of additional expense that you may not be fully prepared for. 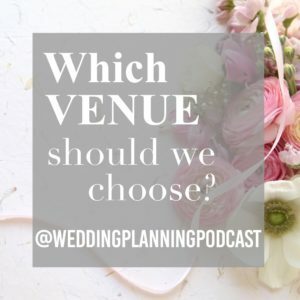 Today we’re talking through some important things to consider if you find yourself torn between two very different venues. In this listener’s case, one option is FREE. Or is it? The other option costs $5,000, BUT – it’s all set up and ready to go. What’s a couple to do? Do you have a wedding venue story that you’d like to share? Please leave a comment below, or find us on Instagram and leave your story in a post. I would love to hear your experiences, and I know other listeners would too!